Continental European before 1800 7 comments Is this likely to be an altarpiece dedicated to St Catherine? Who could be the artist? "And when the emperor saw that in no manner he could resist her wisdom, he sent secretly by letters for all the great grammarians and rhetoricians that they should come hastily to his pretorium to Alexandria, and he should give to them great gifts if they might surmount a maiden well bespoken. [...] And then one that was master above all the others said to the emperor: Know thou, sir emperor, that never was there any that might stand against us but that anon he was overcome. But this maid in whom the spirit of God speaketh hath so converted us that we cannot say anything against Jesu Christ, ne we may not, ne dare not. Wherefore, sir emperor, we acknowledge that but if thou mayest bring forth a more provable sentence of them that we have worshipped hitherto, that all we be converted to Jesu Christ. And when the tyrant heard this thing he was esprised with great woodness, and commanded that they all should be burnt in the midst of the city. And the holy virgin comforted them and made them constant to martyrdom, and informed them diligently in the faith, and because they doubted that they should die without baptism, the virgin said to them: Doubt ye nothing, for the effusion of your blood shall be reputed to you for baptism, and garnish you with the sign of the cross, and ye shall be crowned in heaven." 'Really happy to see a discussion on this. I did some research on the panel and had come to the same conclusion regarding the iconography. I think it has come from an altarpiece dedicated to Saint Catherine and expect that the central panel would have shown Catherine with the usual attributes (spiked wheel and sword), making her easily recognisable. The original catalogue entry for the panel in 1898 describes it with the current title so it has been mistitled for at least a century. Maxentius’ resemblance to King David (for example in the work of Dirk Bout) plus Catherine’s lack of attributes must have caused the confusion. The Austrian attribution is interesting and I know that this is the conclusion that Phillipa Plock came to in the NICE record, however I suggest it is German. I think it has much in common with the Franconian school based around Nuremburg and is reminiscent of the work of Hans Pleydenwurff and Wolfgang Katzheimer, although I am not suggesting it is by them or their workshops. 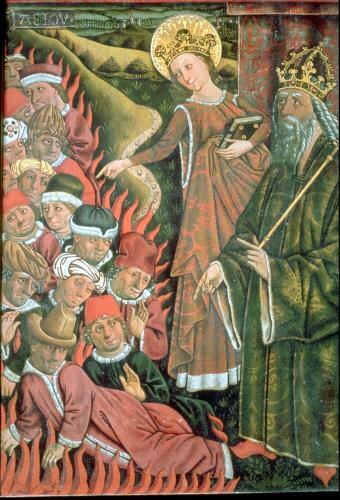 Both Pleydenwurff and Katzheimer painted Catherine in the same red and white headdress/halo combination and Pleydenwurff painted the same burning philosopher episode in the Loffel-holz altarpiece. This looks like a very lovely early panel of extremely high quality. I would recommend contacting Sam Fogg as he will undoubtedly be able to help. Stephan Kemperdinck in Berlin is also someone to be in touch with. We cannot bring this discussion to a conclusion, but we can be confident that this is a panel from an altarpiece dedicated to St Catherine of Alexandria. The panel, which was painted in the late fifteenth century, depicts the Emperor Maxentius committing to the flames fifty philosophers who had failed to overcome in debate arguments advanced by the saint. The panel is certainly of German origin, but we cannot yet be sure exactly where it was painted - quite possibly Austria. In fact, the Austrian origin (circle of so called Master of Schottenaltar) and the German origin (circle of Hans Pleydenwurff) do not have be mutually exclusive. According to the recent research, Master of Schottenaltar could be identified as Hans Siebenbürger, who (as Robert Suckale proposed) was probably trained in the workshop of Hans Pleydenwurff (R. Suckale, "Die Erneuerung der Malkunst vor Dürer", 2 vols., Petersberg, 2009). There can be little doubt that this image depicts St. Catherine of Alexandria and the Burning of the Philosophers by the Emperor Maxentius. 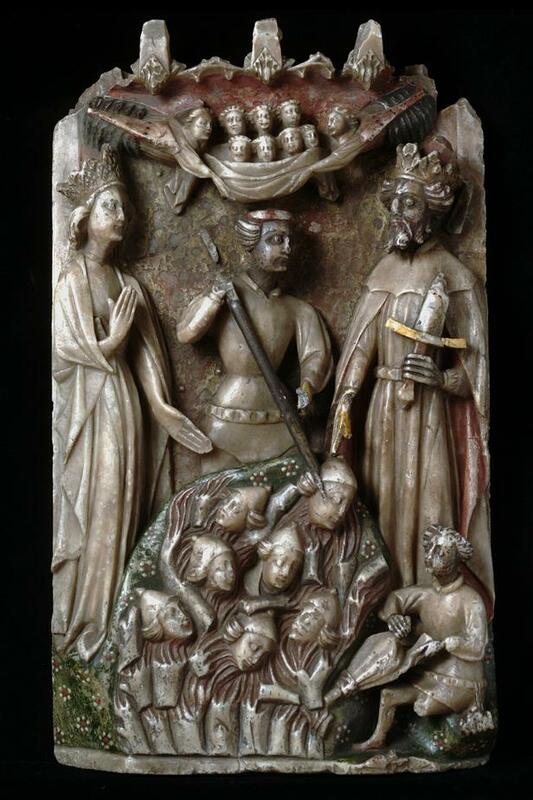 See the attached image of the same scene as rendered in an alabaster panel from the collection of the V&A. Note the inclusion of the wonderfully macabre bellows in the bottom right hand corner of each work. Additionally, attached is a composite image depicting the city of Alexandria, to be found in the 1493 edition of 'Liber Chronicarum' by Hartmann Schedel. Although both images were probably made by artists who never visited the city, and have rendered its features in styles that fit there our ages and local architecture, the basic layout of is the same, with a long bridge starching across a canal, leading to the fortified (Rosetta?) gate, with a church to the left hand side. Please excuse the horrid spelling mistakes and word omission in the entry above!! "Styles that fit there our ages" should read "styles that fit their own ages", and "the basic layout of is the same" should read "the basic layout of them is the same". It is very cold where I am and my fingers were numb on the keyboard!! !